Black Dark Base 700 RGB Tempered Glass PC Case from be quiet! superior FLEXIBILITY AND SILENCE features Presenting the Dark Base 700 PC case in Black from be quiet! The Dark Base 700 boasts unrivalled versatility with astounding cooling and silence features with two Silent Wings 3 140mm PWM fans at the ready. The stunning tinted glass side panel adds a stylish look and you can show off your exterior RGB LED lighting with simplicity. This case from be quiet! is optimized for overclocked and water-cooled PCs, perfect for high-end workstations and desktop PCs. This case features a PSU shroud, ingenious cable routing and HDD slot covers for a super neat interior. For an effective airflow system with noise-dampening vents the Dark Base 700 is the mid-tower case you can trust. Multi-Mode RGB LEDs with Elegant Side Window The Black Dark Base 700 is designed with a stunning tempered glass side panel, which creates the perfect window into your system. Featuring exterior RGB LED illumination on the front panel that is switchable with up to six colours and three modes. LED synchronization with your motherboard or RGB controller is also an alternative option. Optimized for overclocked and water-cooled PCs The Dark Base 700 generates an effective airflow path with noise dampened vents that may be enhanced by up to seven extra fans. There are also three zones provided for water coolers up to an impressive 360mm. An intelligent feature is the detachable top bracket on which you can install radiators and fans before mounting them as a complete unit into the case. modular design and super versatile The Dark Base 700 features flexible installation options thanks to three repositionable single HDD slots. With seven possibilities for installing the HDDs, two of these hidden behind the PSU shroud. The practical slot covers serve to hide any unused HDD slots and keep the inner workings neat and tidy. This allows complete customization suited to your needs. You can install the motherboard tray alongside the left panel in an inverted layout which creates an amended airflow and it’s also removable for use as a bench table. x2 Silent Wings 3 140mm PWM fans Enjoy two virtually inaudible Silent Wings 3 140mm PWM fans, which are equipped with a smooth-running 6-pole motor, resilient fluid-dynamic bearing and an airflow-optimized fan blade. The frame has funnel-shaped air inlets that produce high air pressure and when set to Performance Mode, the fans are able to achieve an impressive 1,600rpm. keep your cables clean and tidy The Dark Base 700 doesn’t just include a PSU shroud that offers you a variety of solutions, it also hides the PSU and keeps the system well-ordered and neat. The cover plates are independently removable, making it possible to install fans at the bottom of the case or the top of the PSU shroud therefore leaving enough space for a radiator in the front. State-of-the-art technology for your system The front I/O port offers you useful features for your high-end PC. A connector of USB 3.1 Type C Gen 2 is also supported. The dual rail PWM fan controller is controlled by the slider control on the front panel, with four potential settings to regulate the speed of your fans. It can be set to PWM hub or operate in a manual 3-step mode. There is also a switch on the front panel to control the exterior LEDs. dual rail fan controller The six PWM fan connectors are distributed over two rails, each is switchable between Silence and Performance Mode. This makes it possible to create two cooling zones that can be controlled by just the front panel switch. If you want all fans to run at the same speed, you can switch both channels to the same mode. be quiet! Dark Base 700 RGB, Black, Mid Tower PC Case, w/ Tempered Glass Window, EATX-mITX, 2x 140mm SilentWings 3 Fans is rated 5.0 out of 5 by 2. Rated 5 out of 5 by Iliyan from Great case Best case I had so far. Very pleased with it. Lots of room inside, very good cooling. 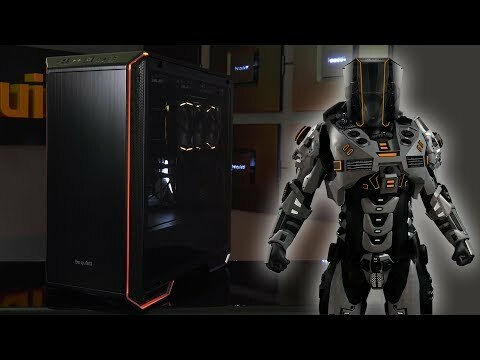 Rated 5 out of 5 by mechanicalmind from Very modern looking case with good features! So I had doubts about this case from some other reviews, but I ended up getting it and..I am pleasantly surprised. I mean it is a bit big under my desk but it has everything I need for my new computer build. The RGB lighting is well done without being in your face, and the tempered glass shows off the internals very well. Speak of which, this case makes DIY building easy! Plenty of space inside as long as you check your dimensions (like duh) and cable management is a dream. I did find with my motherboard I had to poke out the drive slots a few notches but it looks great! It comes with the fans on either end, one exhaust and one intake, so I switched the exhaust to the front quite easily, you just pop of the front cover and dust plate and hey presto. Strongly recommend this case to anyone looking for a quiet PC build with a modern feel.